OH! GOSH! I’ll bet the moosh loved it! Every minute of it! Of all the places to fall asleep (like in her room for starters) she fell asleep at the circus. The flashy, loud, bright circus. 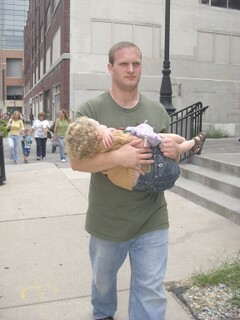 Cody got to carry her for like, oh, 12 blocks, because she stayed asleep. All 31 pounds of her. Did I mention Cody royally busted up his shoulder Thursday night? 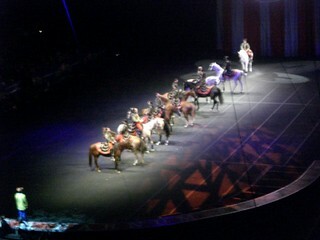 Yay for the circus! The most calming place my kid has been since the womb! This summer we went to a fireworks thing on the fourth where we had to arrive really early to get decent seats. The kids made it all the way through the really long waiting-for-the-fireworks part and promptly fell asleep as the show began. The really, really gun-shot-loud show. Crazy kids. Oh yeah, and why does their weight double when they’re sleeping? Want to hear something ironic? I’m down here in the basement reading my favourite blogs, and listening to the thump-thump-thump of a certain little girl of mine who is very definitely not asleep. I still don’t envy Cody though. Ugh! Ummm, what kind of music were you playing momma while waiting to birth her?!?! Lol…. That’s so funny! 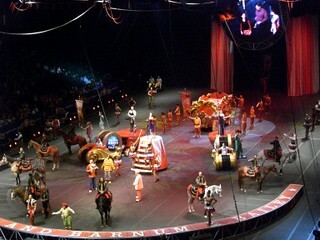 It makes me want to try hiring a circus to perform in my son’s room every night. I’ll try anything! Oh! How fun for you! Sigh. I have one who does the same thing. Sleeps through a tornado, but darned if he’ll actually go to sleep in his crib at night. Still… wasn’t it maybe a teeny, tiny bit fun? STart playing circus music at nap time? 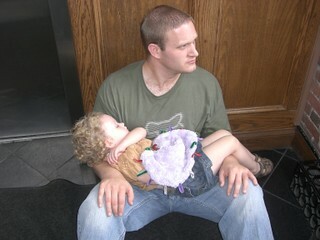 And yet, despite a hurt shoulder, Cody looks pretty tough and capable carrying the Moosh through the city Must be all the practice hauling law books around! oh man…those kids always falling asleep when you think they’d be awake and full of sugar. perhaps i’m trying all the wrong things at bedtime…tonight? we go to the circus!! ahh…we missed the circus this year….but the 3 year old in my home is none the wiser…. Cordy fell asleep for part of her first Wiggles concert, and was fussy for the rest of it. Made us really grateful to spend a small fortune on those tickets. pooka slept through 2 hockey games every weekend for her first 2 years. This kind of thing kills me. I remember the first time we took our oldest daughter to the zoo. She was about maybe 15 months old. We were so excited for her to see the animals! and what did she care about? she had just recently figured out how to do and undo buckles on things like strollers, so all the cared about was walking over to everyone else’s strollers and playing with the buckles. It drove us crazy! “Look sweetie, look at the monkey” and her, just searching for the next buckle to tackle! When I was little, my lullaby was the stereo cranked ALL THE WAY UP. Now I need the TV on to fall asleep. OH! Is that the circus with hot ringmaster Ty?!?!? No, wait, it can’t be, because that’s where we were yesterday. Bellobration! Uh oh! We planned on going this weekend. But I think it’s purely for Jesse. See, he like all the little circus girls, in their circusy apparel. You know the ones, that ride on the elephants or walk on the tightrope, I think. LOL! Whatever! I love Cody’s look of grim resolve. One block, two blocks … fourteen blocks, fifteen blocks. 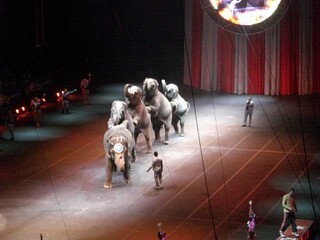 I think I’m going to go to the circus RIGHT NOW as I’m up with insomnia. How do they do that? My kiddos used to do the same thing at big events.